I don't know how this happened, but I am *done* with my Christmas shopping. Still looking for a few extra goodies? Treat the people you love to a gift that's both fun and practical. 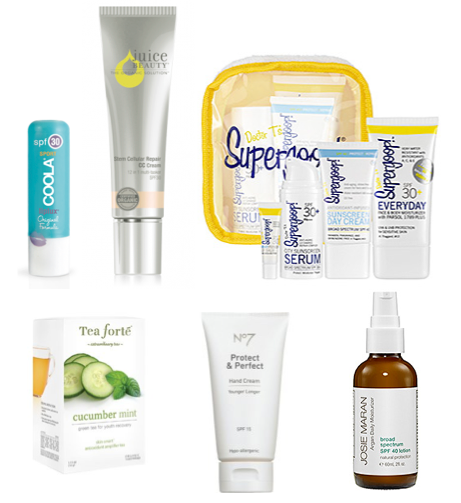 Here are a few skin-friendly favorites that are sure to please (cough cough, hint hint). Coola is an EWG-approved sunscreen company that uses mostly organic ingredients in their products. Don't neglect your lips! They burn, too. This product came in my December Birchbox. It's like a BB cream--moisturizer, tint, sunscreen, etc. all in one--and full of skin-loving antioxidants. This kit is so, so cute! It's loaded with four different types of sunscreens so that you can try multiple formulas from this brand. I've had this one on my wishlist for a while. Might have to treat myself! If you are what you eat, then you are what you drink! I first discovered these teas at a salon last year. Swiss Apple is my favorite flavor. The antioxidants in these teas are essential for repairing skin damage. It doesn't hurt that they taste amazing and that the box is too dang cute. Sneak a little SPF into your daily hand cream to help ward off age spots later. Argan oil is a beauty staple these days. This argan-infused moisturizer nourishes and protects skin. Bonus: it comes in a mini-size that's perfect for Christmas stockings. Peace, love & Christmas cookies! Terrific ideas for some stocking fillers and skin-care HINT HINTS! Especially for us over here at this hottest time of year. What do you think of the CC Cream? I kind of want to try one out, but the whole BB/CC Cream thing is so gimmicky. Not to mention that I need way more coverage than that. It has pretty light coverage compared to similar BB creams I've tried. I think of it more as a moisturizer, and then I layered mineral powder over it. I never found any interesting article like yours. It's pretty worth enough for me. In my opinion, if all website owners and bloggers made good content as you did, the internet will be much more useful than ever before. This is a very smartly written article. I'll make sure to bookmark it and return to learn more of your helpful information. Thanks for the post. I will definitely comeback. Ι'm gone to tell my little brother, that he should also visit this website on regular basis to take updated from newest information. this article? I'd really like to be a part of community where I can get comments from other knowledgeable people that share the same interest. Contact 1-855-637-4055 to acquire a expert clairvoyant reading. I'd like spend a few time to let anyone know about MY OWN brand new the ideal fortune teller page web page. I has become previously functioning definitely tough, many thanks for permitting me to discuss this together throughout you. recognise, other people will be unfamiliar. actually take helpful data concerrning mƴ study аnd knowledge. My last blog (wordpress) was hacked and I ended up losing mqny months of hard worfk due tto no data backup.
' Added a Spectator Options tab in the settings menu including the following:. will disown me three times. Characterized as a suave rocker he is also one of the more humorous gods available in the game. Who said it? "Don't Be a Paleface"